I love cake. So when I saw the table ad for chocolate cake at the restaurant, I knew I had to have a piece. My wife was against it. She didn’t want our 7-year-old son getting any ideas. “It’s nothing,” my wife replied, doing her best not to give the kid any ideas. “It’s just cake,” I said. “The sugar’s gonna make him hyper,” my wife warned me. When the warning didn’t make me budge, she reminded me of the messes our kid made with cake in the past. My wife knows I hate mess. The waiter came by and, on cue, asked if we wanted dessert. My wife said no. I told her it was too late, that I’d already ordered. Bystanders could see the storm clouds on the horizon when I asked for chocolate cake all around, even for the 7-year-old. They shot up out of their seats and ran, leaving full plates of food. Out came the biggest . . . triple-decker . . . double fudge . 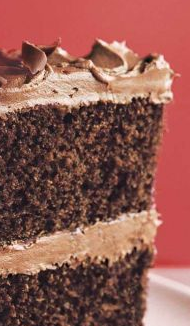 . . towers of chocolate cake I’d ever seen. The cake came with shovels. My wife’s piece intimidated her. She didn’t touch it. I studied my slice, looking for an approach route. My son jumped right in, no plan at all. The face on the busboy was telling: Help! He could foresee cake everywhere. He eyed the kid, looking for compassion. He got no such gesture. He eyed the mom. The mom cried. He eyed the dad. I gave him a look of pure confidence. I think the poor guy ran for the time clock. I slowed my eating during my approach into Quadrant 2 of the cake. That’s when I noticed the mess my son was making. I got scared. Real scared. I caught the busboy in his travels (he must’ve been denied clocking out), and I requested a few hundred napkins. He obliged. I didn’t know where to begin. The mess started on the table surrounding the kid’s plate, then spread to the hands. The hands touched the face and the hands touched the shirt and the pants. From there, the mess made its way to the seat, then to the floor. It somehow managed to make its way to the ceiling, too. Nobody at our table could move -- we were marooned, afraid of the mess as if it were a monster. In hindsight, it wasn’t as bad as it seemed. It was worse. I left my cake unfinished and devised various strategies to get the kid out of the restaurant without tracking cake all over the place and, more importantly, without getting cake on me. But I couldn’t perfect anything. Making matters worse, the restaurant was pressuring us to leave to accommodate a line of people waiting for a table. “You have to go,” the waiter said. The busboy grinned, happy to see me in peril -- misery loves company. I couldn’t pull myself together. Nothing was under my control. The mess was my fault and I had no exit strategy. Then a plan came to me: Apologize to my wife for being dead wrong about the cake (maybe the first true apology in the history of husbands and wives) and apologize to the busboy for the mess. The busboy took pity on me. He armed me with a stack of towels and offered me good luck. I welcomed his warmth with gratitude, and then I buckled down for the job I had to do. I wrapped my kid in towels and sprinted out the door. The towels didn’t stop the mess from spreading. I got cake all over my hands and arms, all over my clothes. I made a chocolate cake path out of the restaurant and into the parking lot. The inside of my car was covered in double fudge. It looked like a cake had exploded in the back seat, and it might as well have. When we got home, the mess continued onto the driveway and into the garage. It landed in the entryway, the hallway and in the bathroom. Even the dog, who was in his doghouse out back, found morsels of cake to eat. My wife and I eventually got everything cleaned up and had our boy ready for bed at 11 p.m. -- two hours past his bedtime. The kid was so hyped up from cake he couldn’t sleep for another three hours. Last night, we went to dinner. After eating, the waiter asked if we wanted cake. The cakes he showed us on a display plate looked so good. Yum. “How about a cookie?” I said.